Today around 18:00 CEST, 72 hrs after launch, ESA’s Operations teams will hand over a very healthy Metop-B for routine operations to our colleagues at Eumetsat. All systems are on green. During LEOP, our jobs on the ESA side were: one orbit manoeuvre, routine hand-over activities, preparation of the memory system and uplink routine commands to ensure spacecraft autonomy (as of now). 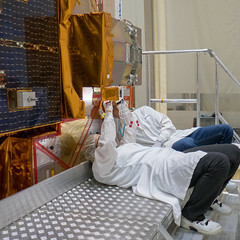 Our colleagues from Eumetsat will be happy to receive a spacecraft in great shape and on a precise orbit.